Save another $20 with Federal's rebate! 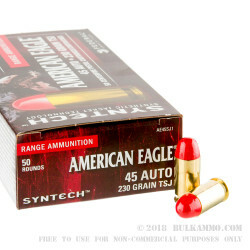 Get the mail-in rebate form here to save $20 on this 500 round pack of 45 ACP ammo today! 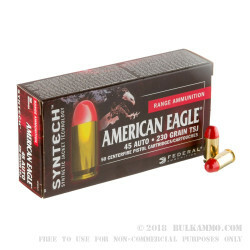 Step into a new generation of shooting with Syntech ammunition from Federal Premium! 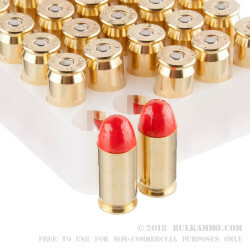 This .45 ACP load uses a traditional "ball" bullet that weighs in at 230 grains for cycling speed, smooth feeding, and perceived recoil that are all identical to the caliber's most common practice rounds. Unlike conventional FMJ projectiles, the TSJ or Total Synthetic Jacket bullet is coated in a light layer of polymer which completely separates lead from the rifled grooves of a handgun's barrel; this greatly reduces metal fouling and contributes to cleaner and more accurate firearms. In addition, the Syntech jacket is less likely to separate from its lead core during collision with hard berms and steel targets for the dramatic reduction of ricochets that could be launched back up range. These .45 Auto loads are constructed with reloadable brass casings which wear non-corrosive Boxer primers in their base pockets. The primers are also free of lead so that shooters confined to indoor ranges won't pollute their own lungs during long strings of fire. As an expansion of Federal's American Eagle line, Syntech loads are intended to be inexpensive for optimal accessibility. Buying in bulk with this 500-round case is a great way to stack your savings while stocking up on ammunition for periodic practice as well as for single stack 1911 divisions in IDPA or USPSA. A: This ammo will not attract a magnet. 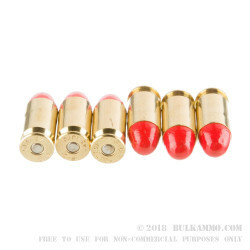 This ammo is comprised of a brass case, a lead core and polymer jacket. This ammo is safe for indoor or outdoor ranges where bi-metal ammo cannot be used.